From the simple ("dogs! ", "rats!") to the scientific ("pithecanthropuses!") to the sublime ("vegetarian! "), you've just gotta love Captain Haddock of Tintin fame for his unique turn of phrase. I've tried to capture as many of his idiocyncratic curses as possible. 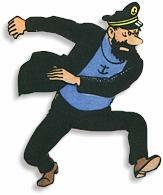 * These curses actually come from an equally hot-tempered ancestor of Captain Haddock: Sir Francis Haddock (The Secret of the Unicorn). ** Not officially a Haddock curse at all, but I still wanted to include it. These two curses are shouted by none other than Snowy himself in Land of Black Gold. Captain Haddock has clearly been an influence on Snowy, although Snowy's personality still shines through because the curses are preceded by his legendary "Wooah! Wooah!" "Billions of bilious blue blistering barnacles". While this isn't specifically a "curse" as I mean it above (a noun/phrase directed at a person or group of people), it's still a vintage Haddock. Similarly, Pratik Chakraborty is fond of the ever-popular "Ten Thousand Thundering Typhoons". Eagle-eyed Haddock curse spotter Sashidhar Kondareddy also suggests "Blue blistering bell-bottomed balderdash" from Tintin and the Picarros. Sashidhar comments: "Haddock's exclamations always involve blistering barnacles; This does not and it rhymes as well as billions of bilious blue blistering barnacles . . . ."
Swapnaa uncovered a good curse in The Shooting Star: "Seismic Semaphore!" Swapnaa notes, however, that this curse wasn't delivered by Captain Haddock, but rather his friend Captain Chester. Gabe suggests that I include "acting the goat" from Destination Moon in the list of honourable mentions. While it's not a curse per se, Haddock's comment about "acting the goat" drives the normally tranquil Professor Calculus into an unprecedented rage. This Haddock webpage has received a fair bit of e-mail over the years (most of it, strangely enough, from India. For some reason Indians just love Tintin and Captain Haddock). Many people have been kind enough to point out classic Haddock curses that I missed. Many thanks to everyone for taking the time and trouble to bring these gems to my attention . . . . . . Note: Haddock actually says the words rather than screaming them at someone in a rage, so they're not a true Haddock "curse" as such. But how could I resist? Note: Haddock seemed to be in a particularly foul mood in this book and Haddockisms abound. Thundering son of a sea-gherkin! Rahul points out another rare Hergé mistake. Glenn is especially amused by Captain Haddock's expert use of sarcasm. Glenn has also long been an admirer of Bianca Castafiore and, in particular, her talent for bungling Captain Haddock's name. Glenn sends along his look at Castafiore's misnomers. Over the years I've received some very interesting information from visitors. I invite you to have a look at their comments. I mention above that most of my e-mail comes from Indians. I've always wondered why Indians love the Tintin stories so much. Tintinologist Sashidhar Kondareddy decided to explore the issue for himself in his excellent article Top Ten Reasons for Tintin's Popularity around the World. Mats Grindal looks at Haddock curses with a uniquely Swedish perspective. Thomas Ryugo submits a number of Tintin and Haddock related observations. Fernando Salazar has some observations about a recent politically correct analysis of Haddock's curses. The official Tintin website should be the first stop for any Tintin afficionado. Everyone's very curious about the upcoming Tintin movies produced by Steven Spielberg (please, Steven, Tom Cruise would not make a good Tintin and Julia Roberts is definitely out for Bianca Castafiore). So www.letintinmovie.com is an excellent site devoted to the upcoming movie trilogy. News, rumours and much more. A clever and computer savvy fan created a Captain Haddock Insult Generator. Haddock's curses are listed on this site in all their glory in the original French. Attention Stamp Collectors! 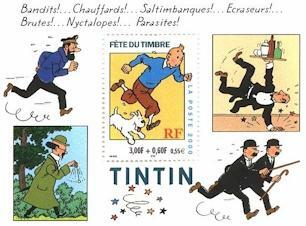 : In 2000 the French postal service recognized Tintin and friends with a wonderful new topical stamp issue. At right is a collector's sheet featuring Tintin, Snowy, Professor Calculus, Nestor, Tomson and Tompson as well as . . . . Captain Haddock, of course. I was especially pleased to see some of Haddock's best loved curses featured so prominently along the top of the sheet. Kudos to popular author Anne Rice for this Haddock-like curse in her book Vittorio the Vampire: "Witchlet! Monster! Larva!" (p. 254). "A Puritan preacher as early as 1579 had lamented the fact that the laws against sturdy beggars were not put into effect. If they had been, there would not be so many 'loitering persons, so many ruffians, blasphemers, swing buckelers, so many drunkards, tosspots, whoremasters, dancers, fiddlers and minstrels, dice players, maskers, fencers, thieves, interlude players, cutpurses, cousiners, masterless servants, jugglers, rogues, sturdy beggars, counterfeit Egyptians . . . .'"
Send e-mail . . . .
Have I missed something? Any comments? Please drop me a line. I'd be happy to hear from you. Search for your favourite Tintin books at Amazon Books.